Project Summary: West Branch landowners and Arizona Open Land Trust (now Arizona Land and Water Trust) partnered to restore and enhance wildlife habitat along the West Branch of the Santa Cruz River. A backyard refugia pond near the West Branch of the Santa Cruz River. Photo by Vanessa Bechtol, Arizona Land and Water Trust. Near the heart of urban Tucson, Arizona lies the West Branch of the Santa Cruz River, a watershed remarkable for its relict riparian habitat. A dense canopy of mesquite and palo verde trees lines the banks of the West Branch, providing myriad birds, lizards, frogs and toads shade from the scorching summer sun of the Sonoran Desert. In response to growing threats from urbanization and the introduction of invasive plant species, West Branch residents have partnered with the Arizona Land and Water Trust (formerly Arizona Open Land Trust), Tucson Audubon Society, University of Arizona, and others to restore riparian habitat, thus improving migratory bird habitat and fostering bird watching. Arizona Land and Water Trust received funding from the U.S. Fish and Wildlife Service Partners for Fish and Wildlife Program (Partners Program) to engage private landowners along the West Branch in proactively improving and preserving the migratory bird habitat afforded by the West Branch and its floodplain. 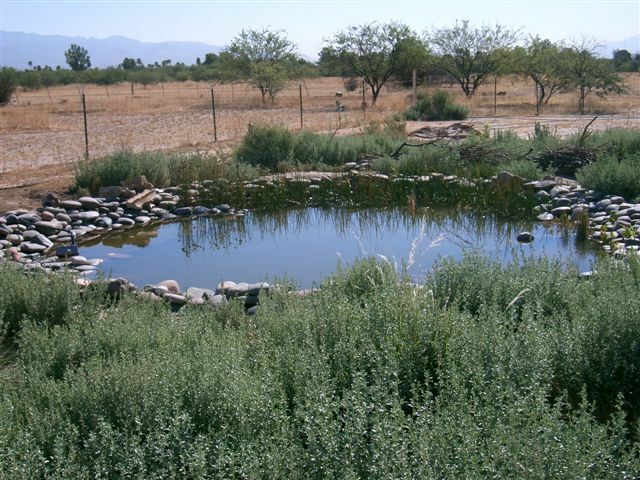 Through grant funds from the Partners Program, landowners constructed backyard refugia ponds for wildlife habitat improvements. Numerous species of special concern and endangered species may be conserved using this kind of approach. The construction of these ponds provides additional water and vegetation that attracts wildlife dependant on riparian ecosystems. Landowners’ active participation and interest in restoring wildlife habitat is evident by the fact that the ponds were constructed almost entirely by the landowners themselves, with the help of a few friends and volunteers. Arizona Land and Water Trust, Landowners, Tucson Audubon Society, University of Arizona, private restoration consultants, Pima County Regional Flood Control District, U.S. Fish & Wildlife Service, Arizona Game & Fish Department, Arizona Department of Transportation, Desert Survivors Nursery, and others. The construction of backyard ponds and revegetating fallow land with native plant species is now becoming a high priority neighborhood restoration project for West Branch landowners. The small size of the ponds and manageability against invasion by non-natives like bullfrogs, crayfish and non-native fishes were important factors in the success of this restoration project. Funding from various sources, including the U.S. Fish and Wildlife Service, Arizona Game and Fish Department, Arizona Department of Transportation, and private donors, is giving landowners the necessary financial and technical assistance to protect and restore valuable bird habitat by protecting biological diversity and reducing habitat fragmentation. The creation of refugia ponds is only one of numerous restoration projects West Branch residents have identified as priorities for their neighborhood. On behalf of the West Branch community, the Arizona Land and Water Trust (formerly Arizona Open Land Trust) and our conservation partners prepared a landowner management plan for the West Branch that aims to maintain and restore a natural and cultural environment that supports riparian habitat, the bosque, biodiversity, and beauty. The three main strategies to accomplish the objectives identified in the West Branch landowner management plan are to conduct riparian habitat restoration projects throughout the watershed, to return a water supply to the channel and floodplain, and to adopt new city and county policies to underpin the objectives. The West Branch Restoration Project illustrates how adding water to the desert environment can greatly enhance habitat for amphibians and birds in the arid southwest.